Arborguard’s Spence Rosenfeld says the world doesn’t need another tree-cutting company. Saving trees is his passion. It all began with a single tree, a black cherry tree that became Spence Rosenfeld’s giving tree. One that gave him great joy as a boy, a refuge and way-cool hangout in high school and, ultimately, his life’s work and calling. He is sitting in his suburban Atlanta office, in Avondale Estates, at Arborguard Tree Specialists, the company he founded in 1981 after borrowing $10,000 and buying a new wood chipper to go with one old truck. Today, Rosenfeld presides over a company that’s widely regarded as Atlanta’s leading tree care specialist; he had $5.5 million in revenues last year and has a reputation throughout the Southeast for providing the best in arboricultural services. They hung a tire swing from one sturdy limb, and planted dozens and dozens more trees. When Rosenfeld turned 15, his dad helped him build a secure floor up in the black cherry, then let his son and his pals finish the four walls and roof of the treehouse. It was there, out in the countryside, playing in the woods, “I just got infected with nature and the outdoors,” Rosenfeld says. His passion, and Arborguard’s focus, now is urban forestry. After earning a masters degree in urban forestry, tree pathology and entomology from Duke’s School of Forestry in 1977, Rosenfeld worked in Durham and Kansas City before arriving in Atlanta in 1981. His business has thrived ever since. Arborguard provides traditional tree services to residential, commercial, construction, golf course and government clients. Those services include tree care and preservation, removal, plant healthcare services (soil therapy, diagnosis and treatment), and consulting and maintenance planning. 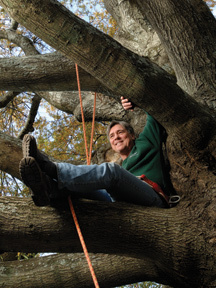 But as both a businessman and arborist, Rosenfeld is very interested in educating clients and preserving trees – especially Atlanta’s countless, priceless giant trees. The stresses on city oaks and elms are severe, and only getting worse. Mighty oaks weren’t intended to grow between the sidewalk and the curb. Atlanta’s continuing construction boom only adds to the problem. So does global warming. And now, there are the debilitating effects of Georgia’s worst drought on record. “It” is Arborguard’s Drought Survival Prescription, a custom blend that sounds more exotic than anything you could order at Starbucks: black sea kelp, humates, yucca, soil fungi, hormones, amino acids and micronutrients. Mix with water and inject into the soil, where the absorption roots are. And, perhaps, pray for rain. Rosenfeld and Arborguard did 28 projects with Post Properties. Business took off. Even before Arborguard opened branches in Charlotte and Augusta, Rosenfeld found he could be selective about whom he worked for, and with. “If you don’t love trees, I’m not your guy,” he says. “I’ve walked away from jobs when someone wanted to mutilate a tree. More clients: Cousins Properties, Olympic Games projects, the city of Decatur and the United Parcel Service of America, Inc. When UPS built its northside headquarters in 1993 in a wooded ravine, Rosenfeld identified some 270 types of trees on site. UPS threatened to fine contractors $15,000 for any tree that was damaged or destroyed; Rosenfeld recalls only two such fines during the early construction phase. Arborguard works with individual homeowners and is now planting trees with the city of Sandy Springs. Some years ago, the company planted 100 in the city of Avondale Estates. Driving with Rosenfeld from his office to Atlanta’s Piedmont Park is an arborial education. He can make a tree diagnosis while going 30 miles an hour. His mood improves as Rosenfeld passes Piedmont Park. He’s one of the founders and a past president of Park Pride; in 1999, he helped the park’s conservancy put together a healthcare plan that saved many of the imperiled big trees. He’s consulting on the Atlanta Botanical Garden’s new skywalk: a suspended pedestrian bridge some 40-45 feet high that will wend its way through the forest canopy of tall trees on the garden’s grounds. “My job is to keep these trees alive while they bring in cranes, concrete and steel, and make sure everything survives,” says Rosenfeld, who estimates that about 30 percent of Arborguard’s revenue comes from consulting and plant healthcare. For the skywalk, small-diameter “micropiles” set deep in the ground will reduce the impact on tree roots. Back at Arborguard headquarters, there is training in progress. Every employee receives 160 hours of training per year; it may cover tree health, with an arborist, or customer service. On this particular afternoon, it’s aerial rescue practice. Working in three-man crews, workers try to simulate a co-worker hurt while up in a tree – in this case, a towering 60-year-old pecan. One crew member “calls” 911 while a second goes up to “rescue” the third. All in five minutes. Bruner moved here from Wisconsin about a year and a half ago to work for Arborguard. “I heard about it from a guy I’d worked with,” he says. “It’s just a great company, takes care of their guys, and they’re on the leading edge in technique and safety. I was blown away by the commitment, the level of training and safety. It’s also about the company’s seven “Eco-Friendly Arbor Cars,” the leased fleet of Toyota Prius hybrids that get 60 miles per gallon of fuel.